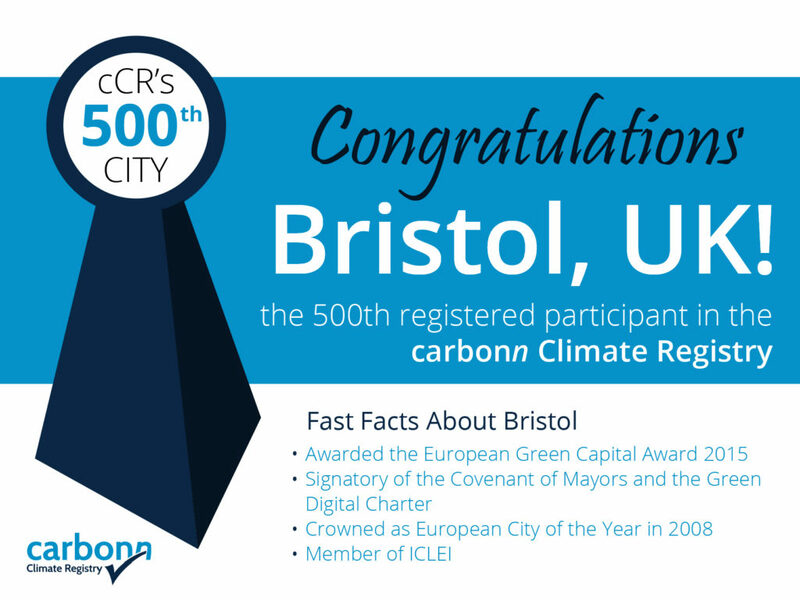 8 December 2014, Lima, Peru: The world’s leading reporting platform for local and subnational climate action – the carbonn Climate Registy (cCR) – welcomes its 500th reporting city today, with the new addition of the City of Bristol, United Kingdom. ICLEI, the leading cities network operating carbonn Climate Registry, announced this today at the ongoing United Nations Lima Climate Change, taking place 1–12 December 2014 in Lima, Peru. Bristol, the European Green Capital 2015 and the first UK city to report into the cCR, now joins the growing list of pioneering cities that have embraced leadership and responsibility in tackling climate change locally and inspiring action globally. Other frontrunners on the cCR include: Seoul, South Korea; Rajkot, India; Belo Horizonte, Brazil; Hermosillo, Mexico; Cape Town, South Africa; Paris, France (host of the COP21); Des Moines, USA; and current and former European Green Capitals Copenhagen, Stockholm, and Nantes. The cCR’s latest count reveals data from 500 cities and provinces / states representing more than 12% of the world’s urban population, covering community greenhouse gas (GHG) emissions of more than 2.8 gigatons of carbon dioxide equivalent per year (GtCO2e/pa). Breaking down the reported data, these advanced cities have reported a total of over 1,000 climate and energy commitments (showing their targets / goals), 1,000 GHG inventories (showing they are monitoring progress) and over 5000 mitigation and adaptation actions (showing they are acting). “The cCR data presents the growing evidence base that local and subnational governments are effectively addressing climate change. With the announcement of Bristol as the 500th reporting participant of the cCR, we hope to further inject positive momentum into the climate negotiations and help bring about meaningful Lima outcomes which will then lay the groundwork for the new climate accord to be adopted in Paris next year. The carbonn Climate Registry was recently designated as the central repository of the Compact of Mayors. Launched at the Climate Summit 2014 in New York, the Compact of Mayors is the biggest initiative for Mayors and city officials to make drastic cuts on their GHG emissions, report progress and prepare for the impacts of climate change. Bristol is located in South West England and has a population of approximately 450,000 (nearly 600,000 in the metropolitan area). Bristol has implemented a long term commitment to improving the environment in the city. Carbon emissions have so far been reduced by 20% despite a growing economy, since 2005. This made Bristol the lowest emitter of the eight major English cities outside London. The aim is to now cut emissions by 40% by 2020 from the 2005 base. Bristol’s local road transport system is responsible for 27% of the city’s energy use and 20% of the city’s CO2 emissions, producing 1 tonne per capita. Bristol has doubled the number of cyclists in recent years and is committed to doubling this number again by 2020 compared to 2010. Bristol has the ambition of becoming a European hub for low-carbon industry and demonstrated nearly 5% growth in the green economy in 2012. The city has committed a budget of €500m for transport improvements by 2015 and up to €300m for energy efficiency and renewable energy by 2020. We are determined to make Bristol one of the most liveable and environmentally friendly cities in Europe. 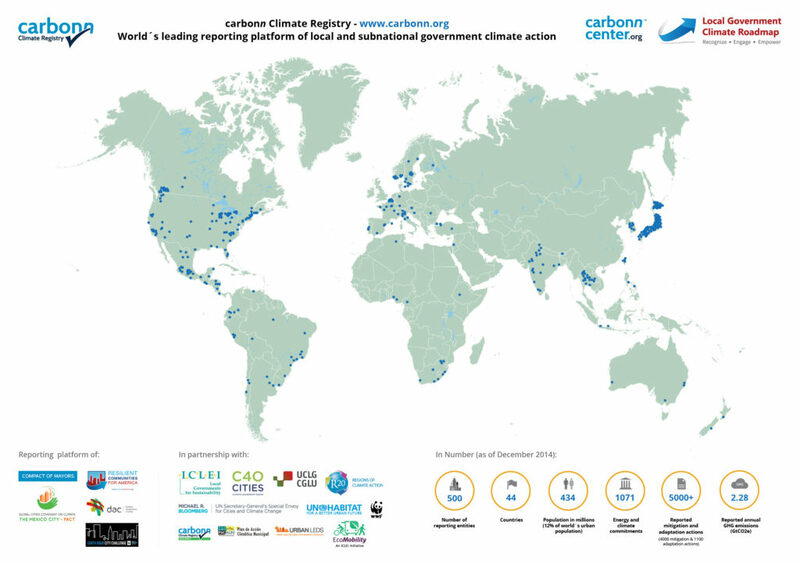 The carbonn Climate Registry is the world’s leading reporting platform to enhance transparency, credibility and accountability for local and subnational climate action. Some 500 reporting entities worldwide, serving more than 12% of the world´s urban population, provide information to the platform. The carbonn Climate Registry was recently designated as the central repository of the Compact of Mayors. Launched at the Climate Summit 2014 in New York, the Compact of Mayors is the biggest initiative for Mayors and city officials to make drastic cuts on their GHG emissions, report progress and prepare for the impacts of climate change. Under the Compact, cities are to set climate targets and report against these targets into the carbonn Climate Registry. The carbonn Climate Registry is referenced at the Technical Paper (TP) released by the On page 10, in paragraph.23 of the addendum, the Local Government Climate Roadmap is prominently highlighted as the global collaboration in climate advocacy, together with the carbonn Climate Registry as the climate reporting platform of local and subnational governments.